Prior to the arrival of humans to the Hawaiian archipelago, the islands supported an incredibly diverse and unique avifauna comprised of at least 113 endemic species. These species ranged from flightless geese, ibis and rails to one of the most famous cases of adaptive radiation – the Hawaiian Honeycreepers (subfamily Drepanidinae), of which at least 59 species have been described. Hawaii also has the unfortunate distinction as one of the epicenters of the extinction of its species. Since human colonization, 71 birds have been confirmed lost, 48 prior to the arrival of Europeans, and 23 since Captain Cook first arrived in 1778. Of the 42 extant endemic taxa, 31 are federally listed (29 species and 2 subspecies), but 10 of these have not been observed in as many as 40 years and are of unknown status. Key threats to the remaining species include: habitat destruction and degradation by humans and introduced ungulates, non-native diseases and predators (feral cats, barn owls, rats, and mongoose), and habitat-altering invasive plants. Non-native mosquitoes are vectors for avian pox and avian malaria, both of which have had devastating effects on the forest bird populations, which had evolved without these threats. 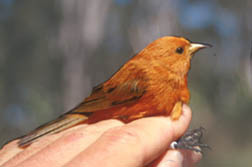 Thus, most of Hawaii’s extant forest birds (passerines) are restricted to high elevation forests (above 1400 meters) or remote islands where mosquitoes are limited by temperature or absent altogether. Managing and researching birds in these areas presents many logistical challenges, including significant expense, difficult field conditions, and the need for ongoing management. In order to protect and save the remaining diversity of the islands, the State of Hawaii supports a variety of projects dedicated to researching and developing conservation techniques to monitor populations, reduce the effects of non-native predators, and restore habitat for the endangered forest birds across the state. We also work with partners at the U.S. Fish and Wildlife Service and San Diego Zoo Institute for Conservation Research to intensively manage some of the most endangered species in captivity (i.e. the `Alalā or Hawaiian Crow, which is extinct in the wild) for eventual release back into the wild. For more information on a few of the key projects that we support and manage, please visit their pages to the right.